Amazon Web Services offers reliable, scalable, and inexpensive cloud computing services. 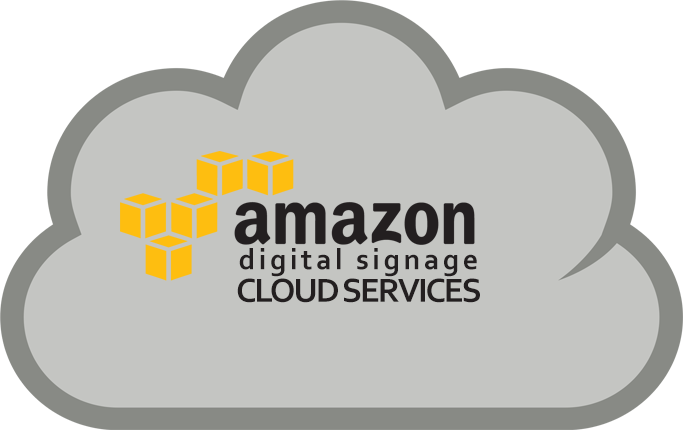 MediaSignage provides the world's leading solution in Digital Signage services. Combine the two and you get an Enterprise class Digital Signage solution for an affordable monthly cost. combines the functionality and cost savings of mediaCLOUD with the control and security of a self-hosted network. It’s the feature-rich software you’ve grown to love, now with scalable cost savings of the Amazon Cloud. Not only does the mediaHYBRID include 256 bit encryption, but Amazon’s secure storage means your dedicated server is backed by military-grade perimeter control, state-of-the art electronic surveillance and 24x7 monitoring by trained security personnel. . The Elastic Compute Cloud (EC2) from Amazon takes the SignageStudio to a whole new level, allowing for resizable compute capacity, backed by the reliability of AWS. Start small and grow on your terms, only paying for what you use and increasing your computing needs with your client demand. Use computing resources with lightning-fast speed and efficiency. EC2 reduces the friction of adding computing resources and booting new server instances as your demand fluctuates. The dedicated mediaHYBRID is truly the best way to maximize the power of our enterprise SignageStudio. Break free from the shared hosting of our mediaCLOUD service with mediaHYBRID. A dedicated server racked with AWS means you maintain full Administrative control, including remote desktop, of your server at all times. In short, you hold complete control over the who, what and when of your digital sign network. Expensive upfront software licenses and annual maintenance and support contracts are a thing of the past with the hosted mediaHYBRID. Get all the benefits of hosting your own server without the the gut-wrenching up-front and recurring cost requirements of “paying per license.” And, in traditional MediaSignage fashion, there are no setup costs and no long term contracts. The best part is that if you’re already on the mediaCLOUD (free or enterprise, it doesn't matter), we’ll migrate all your existing content assets to your dedicated server absolutely free. StudioLite which is part of the mediaHYBRID provides the flexibility of a truly open framework, allowing you customize, brand and personalize to fit the needs of your organization. You can even fork it on Github for greater access and development. Backed by our team of expert support artists, mediaHYBRID customers gain access to expanded expertise from our staff of highly-trained signage specialists. Our support operators are available by phone, live chat and email at your convenience. With the expanded features of our hybrid solution, you'll gain access to more custom applications for your custom digital signage and menu board screens. Use the apps to integrate seamlessly with Facebook, Instagram, Twitter & more. Choose from hundreds of professionally created pre-configured and pre-designed content templates. Creating content with a pre-arranged templates ensures you save valuable time and money in the content creation and deployment process. mediaHYBRID is best suited for networks that have plans to grow rapidly without the technology getting in the way. The best part is, you only pay for what you use saving you money over our competition.